No. D653,699 (the ‘699 Patent”). For each of Oakley’s six asserted design patents, the Complaint includes images of allegedly infringing products sold in 7-Eleven stores. For example, the Complaint includes the images copied below of sunglasses found in a 7-Eleven in San Diego, California, which are alleged to infringe the ‘579 Patent (Fig. 1 of which is copied below). The Complaint also alleges that the sunglasses pictured directly below, which were found in a 7-Eleven store in Laguna Hills, California, infringe the ‘699 Patent (Fig. 1 of which is provided below the Laguna Hills 7-Eleven sunglasses). 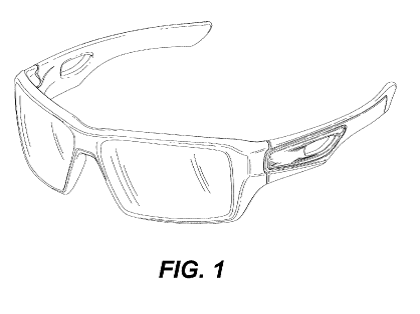 Oakley has frequently sought to protect its intellectual property rights, including asserting some of the same design patents listed above. We have reported on numerous complaints filed by Oakley involving its design patents, a few of which can be found here, here and here. Special thanks to Ms. Clothilde Lucius for contributing to this post.